Suaeda Forssk. ex J.F.Gmel., Onomat. Bot. Compl. 8: 797. (1776); nom. et type cons. prev. Suaeda Forssk., Fl. Aeg.-Arab. 69, (1775), nom. inval. Type: Suaeda vera Forssk. ex J.F.Gmel. Belowia Moq., Prodr. [A. P. de Candolle] 13(2): 168. (1849), orth. var. "Belovia"
Type: Brezia heterophylla (Kar. & Kir.) Moq. Type: Calvelia pterantha (Kar. & Kir.) Moq. 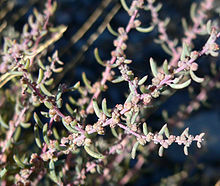 Chenopodina (Moq.) Moq., Prodr. [A. P. de Candolle] 13(2): 47, 159. (1849) nom. superfl. Type: Suaeda sect. Chenopodina Moq. Dondia Adans., Fam. Pl. (Adanson) 2: 261, 550. (1763), nom. superfl. Lerchia Haller ex Zinn, Cat. Pl. Gott. 30. (1757), nom. rejic. versus Lerchea L., replaced by Dondia Adans. Type: Schanginia linifolia (Pall.) C.A.Mey. Lectotype (designated by Schenk & Ferren 2001, Taxon 50: 864. ): Schoberia acuminata C.A.Mey. Type: Trikalis triflora Raf., nom. illeg. superfl. Bunge, A.v. 1843. Novum genus Chenopodearum. Linnaea 17: 120. BHL Reference page. Schenk, H.J. & Ferren Jr., W.R. 2001. On the Sectional Nomenclature of Suaeda (Chenopodiaceae). Taxon 50(3): 857–873. doi: 10.2307/1223715 Reference page. Hassler, M. 2018. Suaeda. World Plants: Synonymic Checklists of the Vascular Plants of the World (version Mar. 2018). In: Roskov Y., Abucay L., Orrell T., Nicolson D., Bailly N., Kirk P., Bourgoin T., DeWalt R.E., Decock W., De Wever A., Nieukerken E. van, Zarucchi J., Penev L., eds. 2018. Species 2000 & ITIS Catalogue of Life. Published on the internet. Accessed: 2018 May 24.
International Plant Names Index. 2016. Suaeda. Published online. Accessed Jan. 16 2016. Tropicos.org 2016. Suaeda. Missouri Botanical Garden. Published on the internet. Accessed: 2016 January 22. For more multimedia, look at Suaeda on Wikimedia Commons. This page was last edited on 7 March 2019, at 12:55.